Welcome to the world of cars! Renewed style, new engines and more technological content to continue playing its starring role. The new Alfa Romeo Giulietta MY 2014 will contribute to consolidating the outstanding sales performance the model has obtained so far: from in mid-2010 to date, more than 212,000 units have been ordered worldwide. The new 150 HP 2.0 JTDM engine is making its first appearance with the 2014 range. It is equipped with the second-generation MultiJet injection system that both optimises engine combustion in all operating conditions and ensures reduction in fuel consumption and noise at the same time. Using a small-sized turbocharger means delivering the highest torque in the segment at low rpm (380 Nm at 1750 rpm) and maximum running flexibility. The heart of the Alfa Romeo Giulietta MY 2014 2.0 JTDM 2 engine is without a doubt the third generation Common Rail injection system that uses innovative injectors able to control the amount of diesel injected into the combustion chamber with utmost precision with a particularly quick and flexible injection sequence thanks to the balanced hydraulic servo valve. More in detail, up to eight injections per stroke are possible together with strategies that optimise the increasingly advanced combustion, such as the Injection Rate Shaping (IRS) system which involves two consecutive injections so close together in time as to generate a continuous and modulated fuel supply into the cylinders. In this way the combustion process is improved, all to the benefit of quieter operation and particulate and nitrogen oxide (NOx) emissions. Furthermore, the new injection system is even simpler and more reliable because the injectors have a simpler structure with 40% fewer components. Finally, it should be noted that with the new 2014 range all available engines have been updated to comply with the 'Euro 5 +' (Euro 6 ready) standard. Designed to enrich the driving experience and perfectly integrated in the design of the car, the innovative Uconnect multimedia device is available with a 5" or 6.5" touch-screen with satellite navigation system and voice commands for easy control of several multimedia sources and outputs. The Uconnect system lets you access all the main functions, from the analogue and digital radio (DAB) - in markets where the optional is sold - through to all the main multimedia resources (mediaplayer, iPod, iPhone, smartphone) which can be connected via USB port or Aux-in socket. The system also includes an advanced Bluetooth interface to access extra functions, such as phone call management or reading received SMS text messages via text-to-speech technology, innovative Audio Streaming system that reproduces music files and web radio stations directly from a smartphone in streaming via Bluetooth on the UConnect device. Finally, with the Uconnect Nav with 6.5" touch-screen, the Alfa Romeo Giulietta MY 2014 customer can rely on the satellite navigation function with 3D bird's eye view maps and progressive route guidance or the text-to-speech function for entering the destination address using voice commands. The new infotainment system will be available, on request, on the entire Alfa Romeo Giulietta MY 2014 range. Moonlight Pearl, Anodizzato Blue and Bronze: three new liveries to enhance the dynamic lines of a model that is a blend of sportiness and elegance. The new look of the front grille and the chrome-plated frame of the foglights renew its front. This is the starting point for the design of the entire car, which combines an energetic personality with a distinctly elegant form. The front headlights have DRL with LED technology and a day light function for maximum active safety. The innovative rear lights use LED technology in the same way, which serves not only a stylish purpose but also preventive safety. Finally, the three new alloy wheels (16'', 17'' and 18'') clearly highlight the profile of the Alfa Romeo Giulietta MY 2014. The side windows recall the appearance of a coupé and emphasise the dynamism and fluidity of the shapes, thanks also the concealed rear door handles. The ribs on the vehicle sides elongate the car while the clean lines which end at the rear accentuate the angular shape of the car body. Attention to detail and high quality materials chosen to represent the ultimate expression of Italian style. What particularly stand out are a new door panel and handle and the brand new insert on the central console and dashboard. All elements are treated with uniform scratch-proof paint and the trims are homogeneous in colour and materials. The result is a superior quality environment that welcomes passengers into a warm and enveloping atmosphere. The seats and steering wheel are new, too, and further highlight the perceived quality and on-board comfort. In particular, making their début on the Quadrifoglio Verde version are the new specific sports seats upholstered in black leather/Alcantara with contrasting stitching with electro-welded logo on the backrest (also available on the QV Sportiva Pack). Now the Progression version offers the black/anthracite grey fabric, while the Giulietta MY 2014 Distinctive customer can choose between two colour combinations for the fabric upholstery: black/tobacco or anthracite grey. The Exclusive version comes with leather/fabric upholstery that can be in the shade of either black/anthracite grey or tobacco/anthracite grey. All the upholstery is available in top quality leather in the shades of red, tobacco or black on request. Sporty design and a new form which refers to the Alfa Romeo grille also for the steering wheel, now characterised by a aluminium insert, black, white or red stitching - depending on the interiors and trim levels - and an upholstery in top quality leather made with special foam that ensures a safe and immediate grip. Finally, the luggage compartment has been renewed with a specific black trim for the entire volume (bottom, sides and behind the rear seats). The storage compartment on the left of the steering wheel, the upper glove compartment on the dashboard and the USB port starting from today placed close to the DNA selector - so its use is more convenient and immediate - complete the new features inside the Alfa Romeo Giulietta MY 2014. Alfa Romeo Giulietta has assumed a place in the tradition of the best Alfa Romeo models, drawing on its heritage of dynamic performance, without compromising on efficiency and convenience in everyday use. The secret behind this performance is continuous technological research, which finds its utmost expression in the Giulietta. This is demonstrated by the "Compact" architecture - created with high-resistance materials which allowed the weight of the structure to be limited - in addition to the Dual Pinion active steering and the sophisticated suspension configurations (MacPherson at the front and the advanced Multilink at the rear). Furthermore, driving satisfaction and comfort adapt to meet every customer's specific needs thanks to the Alfa DNA selector, a device that customises the vehicle's behaviour to suit different road conditions and driving styles. The new architecture of the Alfa Romeo Giulietta was designed to integrate the vehicle's different systems and exploit them to the full, thus emphasising the three set-up functions (Dynamic, Normal and All Weather) available through the Alfa DNA selector. The device, fitted as standard on the entire range, is designed to modify the operating parameters of the engine, gearbox, steering system and Q2 electronic differential, in addition to the behaviour logic of the Electronic Stability Control system (ESC). Outstanding quality of construction impressive on every level for an excellent standard of comfort. The longitudinal and vertical filtering capacity of the suspension ensures high driving comfort while important technical refinements - such as specific interventions on bumpers, wheel arch, pedal unit and luggage compartment - make the Alfa Romeo Giulietta MY 2014 even quieter and more enjoyable to drive. Comfort is another strong point: the quality of the materials used for the dashboard and the ergonomics of the interior space in general contribute to a great on-board experience. There hasn't been any compromise on load capacity either, thanks to a luggage compartment with a very regular shape which can be exploited to the full, with a width of 1023 mm between the wheel arches and a maximum capacity of 350 litres, in line with that of its main rivals. The Giulietta's exceptional efficiency is confirmed by the excellent performance to consumption ratio, a value which is further increased by the latest-generation Alfa TCT twin dry clutch automatic transmission. The innovative transmission ensures greater efficiency and driving comfort and a sportier feeling than the automatic transmissions with torque converter. Suffice it to say that the Giulietta MY 2014 powered by the 170 HP 1.4 TB MultiAir with TCT achieves outstanding results in its segment, improving on the already impressive standard set by the manual gearbox both in acceleration from 0 to 100 km/h and fuel consumption and CO2 emissions. The transmission works in either all-automatic or sequential mode. The "up and down" positions of the precise and ergonomic gear lever are managed manually by the driver, who can also choose to combine it with the "shift paddles" on the steering wheel. The driver can also customise his car's character using the Alfa DNA driving selector to enhance its features of comfort, performance, safety and efficiency. 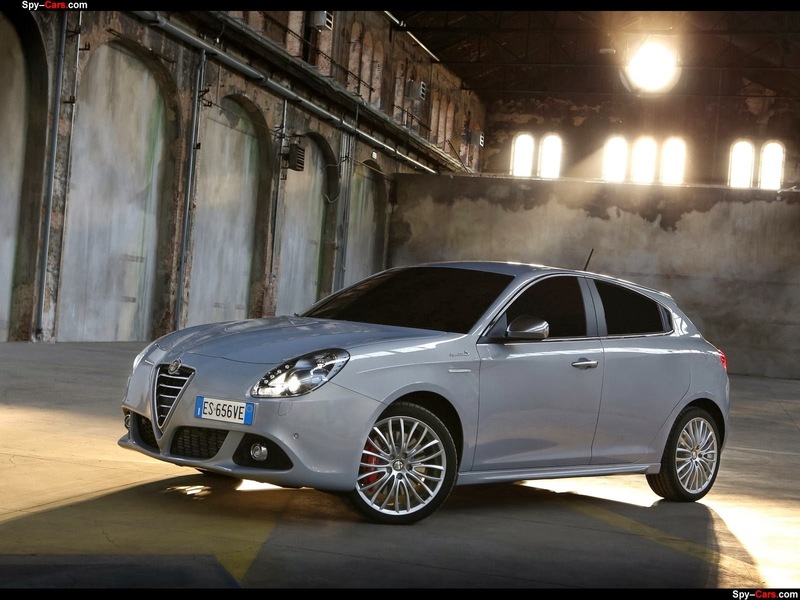 Alfa Romeo Giulietta MY 2014: one of the safest cars in its category that turns the tables for those who think that safety detracts from performance. In addition to the undisputed dynamic features of the model, all versions fit plenty of standard equipment, such as six airbags, ESP, three-point seat belts with double pretensioner, anti-whiplash system and third load line for excellent passenger compartment protection. These are followed - again as standard - by certain systems which are unique in this category, such as Alfa DNA with electronic Q2 differential, the system which allows torque to be transferred to the outer wheel when cornering, to prevent understeer at the front, with benefits for the car in terms of traction, safety and driveability. And there's more: DST, which prompts drivers to correct their driving in the event of an emergency through impulses at the wheel. Finally, the Pre-fill system guarantees maximum promptness during emergency braking. All these features translate into an extremely high active and passive safety level. The Giulietta earned five stars in crash tests according to the stricter parameters introduced by Euro NCAP from its launch, scoring 97% for adult passenger protection, one of the highest scores in the category. 5 trim levels (Impression, Progression, Distinctive, Exclusive and Quadrifoglio Verde) - depending on the countries where marketed - to offer safety, comfort and driving pleasure to the various Alfa Romeo Giulietta MY 2014 customers. All the devices linked to active and passive safety are fitted as standard on the entire range. The standard equipment of the Impression trim level includes: 6 airbags, the Alfa DNA system (with Q2 electronic differential and DST), and the innovative ESC (including ASR and Hill Holder). The manual climate control system and tyre pressure monitoring sensor complete the standard equipment. The second level, Progression, proves to be an ideal choice for those looking for more on-board comfort with the added rear electrical windows and CD/MP3 sound system with dual tuner function and controls on the steering wheel. The Distinctive version adds: 16" alloy wheels, leather steering wheel with radio controls, fog lights, dual zone automatic climate control system, new seats upholstered with quality fabric, front armrest with storage compartment and the elegant chrome-plated insert (chrome line) that frames the side windows and refrigerated storage compartment. The Exclusive trim level is at the top in terms of comfort and technology and offers: leather/fabric upholstery, 17" alloy wheels, rear armrest, lumbar front seat adjustment, electrically folding door mirrors, rear parking sensors, electrochromic rear view mirror and rain and dusk sensors. The range is completed by the 235 HP Alfa Romeo Giulietta 1750 TBi Quadrifoglio Verde (four-leafed clover), a legendary symbol which has competed on tracks all over the world. Equipped exclusively with the highest-performing engine in the range, the version is distinguished by its thoroughbred sports design, combined with 17'' (optional 18'') wheels, guaranteeing segment-leading driving pleasure and surprisingly limited fuel consumption and emissions for this power rating. The Giulietta thus reinterprets the "Quadrifoglio Verde" with a modern touch, combining the utmost driving pleasure with greater environmental awareness for an eco-conscious and environmentally-friendly sportiness. Style, Visibility, Comfort, Lusso, Premium, Business, Sport and QV Sportiva: many specific packs available depending on the market to further customise your Alfa Romeo Giulietta QV MY 2014. The QV Sportiva Pack is designed for customers who want a car with exciting performance, top-level technological equipment and great looks. Inspired by the legendary Quadrifoglio Verde, the QV Sportiva Pack includes: a sporty low ride, new 18" alloy wheels and 225/40 tyres, side skirts, oversized Brembo brakes with red calipers, dark finish headlights and rear Privacy windows. The same sporty imprint is evident inside, where the dark-coloured passenger compartment includes: aluminium pedal unit, leather steering wheel with white stitching (or red with leather seats), aluminium kick plate with Quadrifoglio Verde logo and a burnished brushed aluminium insert on the dashboard. The seats are available either in leather and Alcantara or full grain leather.